The Main Centre Mennonite Brethren was founded in June 1904 by recently arrived settlers from Steinbach, Manitoba. Main Centre is located 50 km east-north-east of Swift Current, Saskatchewan, and just north of Herbert. It was founded by 15 charter members and began worship under the leadership of Benjamin Janz. The church met in Main Centre school until the construction of a church building in 1907, with subsequent building programs in 1922 and 1945. Main Centre was originally called the Bethel Mennonite Brethren Church. The first baptism was held on 16 August 1905. In 1915 they hosted the North District Conference of the Mennonite Brethren (later known as the Canadian Conference). Membership peaked in 1937 at 239. The economic oppression of the Great Depression forced many farmer–members to move to British Columbia or to other, more fertile, parts of Saskatchewan. The History of the Main Centre Mennonite Brethren Church, 1904-1979. 1979, 40 pp. Mennonite Brethren Herald (27 May 1988): 62; (28 August 1992): 25. Toews, John A. A History of the Mennonite Brethren Church: Pilgrims and Pioneers. Fresno, CA, 1975, 160. Available in full electronic text at: https://archive.org/details/AHistoryOfTheMennoniteBrethrenChurch. Centre for Mennonite Brethren Studies, Winnipeg, MB: Volume 592, Reel 45. Regehr, Jacob I. and Marlene Epp. 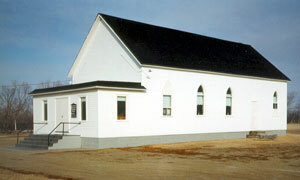 "Main Centre Mennonite Brethren Church (Main Centre, Saskatchewan, Canada)." Global Anabaptist Mennonite Encyclopedia Online. August 2011. Web. 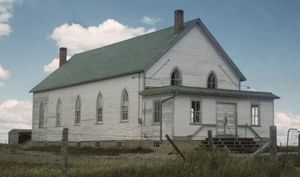 18 Apr 2019. http://gameo.org/index.php?title=Main_Centre_Mennonite_Brethren_Church_(Main_Centre,_Saskatchewan,_Canada)&oldid=163405. Regehr, Jacob I. and Marlene Epp. (August 2011). Main Centre Mennonite Brethren Church (Main Centre, Saskatchewan, Canada). Global Anabaptist Mennonite Encyclopedia Online. Retrieved 18 April 2019, from http://gameo.org/index.php?title=Main_Centre_Mennonite_Brethren_Church_(Main_Centre,_Saskatchewan,_Canada)&oldid=163405.